Simon Says: BREAKING TRANSFER NEWS!! I can exclusively reveal, thanks to links within the club that Arsenal have made their first signing of the summer. This record-breaking deal will be officially announced as soon as the details have been finalised.. Yes, club mascot 'Gunnersaurus' has signed a new contract extending his original deal which started in the Stone Age till 2011. 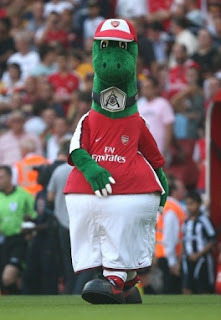 Manager Arsene Wenger said that he was pleased with 'Gunnersaurus'' versitility, being able to take over the tea lady's role as well as continuing as club mascot.